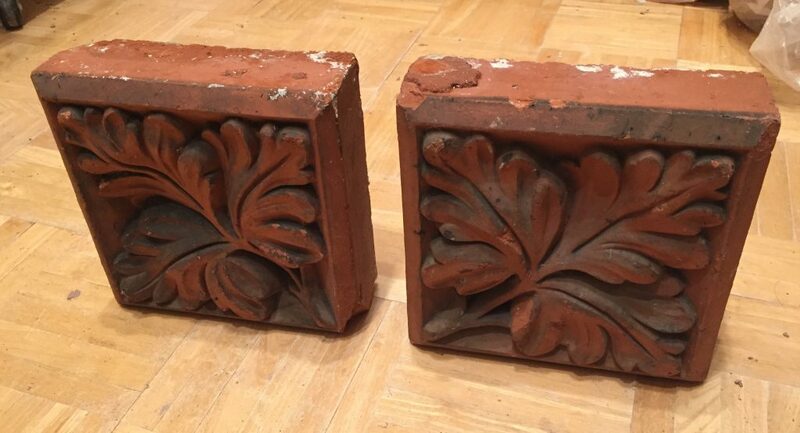 I bought 2 of these red terracotta blocks that came from a building in Newark NJ, these would date back to the 1880s. No identification marking, numbers or anything on them as is typical of these pieces in that decade. The design has no undercuts at all, is very smooth, and sharp crisp edges and corners which indicates to me that the original pattern was probably carved wood and the mold taken directly from it. 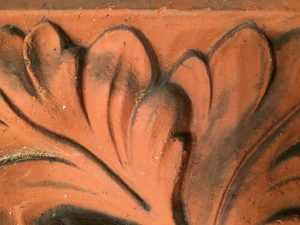 The same leaf design sans the specific angled border around the perimeter of these 7-1/2″ square designs may have been incorporated in cast iron elements too as a foundry pattern since wood carvings were typically made for sand casting. The coal soot blackening pattern on both blocks proves these were embedded in the brick wall in the position they are in the photo- alternated left and right. These would have likely been part of a row of them as a frieze band across the facade. The backs were slightly scooped out by hand leaving a vertical center intact for structural strength since there would be brick wall above these.